The virtues of ceramic tile for bathrooms and kitchens are well known, but many of those advantages also make it a good choice for living rooms. Ceramic tile is durable and easy to maintain. It can handle even the highest traffic locations without showing much wear. Spills, chips and other accidents really aren't an issue provided the floor was installed correctly. And the design advantages are undeniable: modern printing techniques give you a wealth of aesthetic options for creating a floor that is truly unique to your living area. For example, there are now porcelain mosaics that look so much like exotic hardwood planks that you will have trouble telling the difference. The costs of a ceramic tile floor are comprised of two elements: the price of the materials themselves, and the cost of installation labor. When purchased at big-box stores or tile specialty outlets ceramic tile can range from less than $1 per square foot for plain solid-color tiles to just under $20 per square foot for porcelain tiles that mimic the look of fine marbles or woods. At the high end, prices rival that of natural stone tiles, but very elegant and serviceable tiles are available in the $3 to $7 per square foot range. Tile is a fairly labor-intensive flooring to install, and DIYers can enjoy considerable savings by doing this work themselves since roughly half the cost of the floor is in the installation labor. Size: Ceramic tiles are generally sold in squares of 12" x 12", 6" x 6", 18" x 18" and 24"x 24," but a growing trend, especially for porcelain tiles, is for the pieces to be formed in rectangular planks form designed to resemble hardwood. ​Sizing tip: In larger living rooms, use larger tiles that are proportional to space. In smaller spaces, smaller tiles will provide visual interest, making them seem more spacious. Patterns: Because they can be printed with almost any color or image, ceramic tiles allow you to create very intricate patterns. Vibrant, contrasting colors can be used, mixed with different shapes and designs to build a floor which will perfectly express your personal tastes. Solid vs. mosaics: Mosaics in their modern form are ceramic tiles assembled into mesh-backed sheets of very small 1" x 1" or 2" x 2" tiles. Originally, styling with mosaic tile was a highly prized means of architectural expression, and this modern form of ancient art can bring a truly unique and vivid sense of style to your space. Borders: Contrasting tiles can be cut to size and then used as borders to accent the outer boundaries of a living room. Many ceramic tiles are offered in "families" that include various complementary border tiles and cove perimeter tiles. Accent tiles: These are unique pieces which are placed as accents or emblems within an otherwise normal ceramic flooring installation. They may contain a unique picture or have a vibrantly contrasting color adorning their surface. The purpose is to draw the eye, creating a sense of decorative beauty within the pattern of the flooring. Natural stone refers to a variety of hard materials which are quarried from mountains around the world. For flooring applications, they are usually cut into square or rectangular tiles and installed in a manner similar to ceramic tile. These can be very exotic or very ordinary-looking materials. Most (but not all) are hard, durable, and long-lasting. Prized for the unique colors and characteristics, their natural quality is what most often causes people to choose real stone over manufactured ceramics, although this distinction is lessening as manufacturers perfect the art of mimicry with ceramics. Natural stone, however, is usually more expensive, both to purchase and install, and it is not nearly as maintenance-free as ceramics. Natural stone must be sealed periodically and will stain more readily than does ceramic tile. Ceramics are also "natural" in that they are made from natural clay materials, but they are manufactured by humans through a process of casting and firing. They are more durable, and easier to maintain than natural stone tiles, as they can be made permanently impervious to moisture through glazing. Hardwood and ceramic have similar merits, in that a good, well-cared-for installation can last for years. Modern ceramics can now be shaped and printed look like many different species of hardwood flooring. One of the major differences between the two options is the price. Ceramics are much less expensive than real solid hardwood flooring installations. Ceramics also tend to be easier to keep clean and maintain over time, since they are less susceptible to water damage and staining. A single major advantage of hardwood is that these floors can be refinished when spills, scratches, and scars start to pile up on the wood's surface. With many types of hardwood, you can simply sand down the wood to get a fresh start. This is not possible with ceramic tile—but then again, tile does not wear down the way wood does. Ceramic is one of the easiest floors to maintain over the course of its life. Glazed tiles are impervious to water and stains, and even unglazed tiles can be sealed and protected. Grout lines should be sealed annually. Other than this, the floor will require only regular sweeping and damp mopping to remove dirt and loose debris. 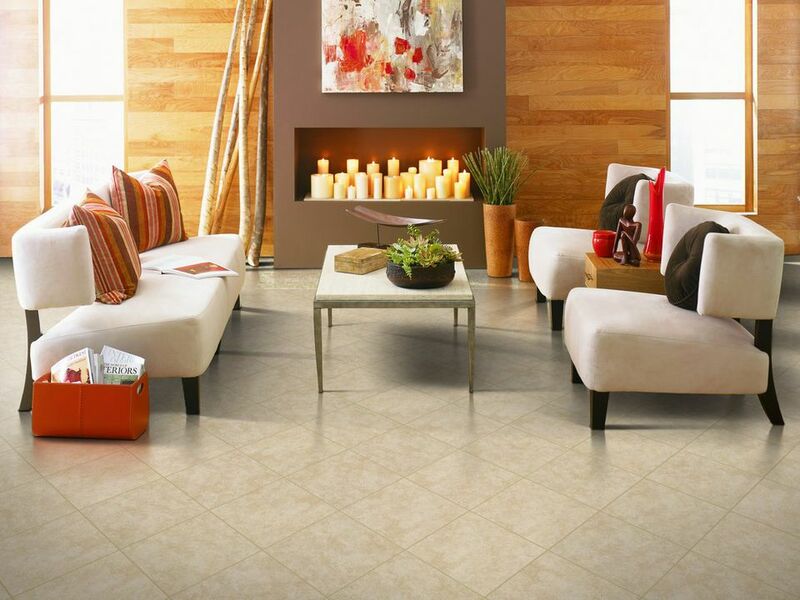 Because of this, ceramic is a great choice for high-traffic living room flooring situations. It is also popular among parents, as it is very difficult for children to stain or damage ceramics. The drawbacks of ceramic tile flooring are minimal. Most often cited is the fact that ceramic tile is cold and hard. The coldness can actually be an advantage in very hot climates—which is one reason why it is often found throughout the home in Southwest residences. But tile can be "warmed" and softened by using rugs, or by installing radiant-heat systems below the floor. The hardness of a ceramic tile floor may be an issue in a home where there are small children or elderly people susceptible to falls. Here, large area rugs may be a good idea—or you may want to consider carpeting or another softer flooring material, such as cork. For many people, though, ceramic tile flooring should be strongly considered living rooms and other family spaces.